The Work Log is a great piece of functionality added to Maximo in version 6. It provides a chronological and historical view of notes captured against a Work Order or a Service Request. In previous versions, the record’s long description field was the only mechanism for capturing notes. Now, the Work Log allows for better organization of notes – specifically how notes were captured, displayed, and reported on. As versions of Maximo progressed over time, more applications began adopting Work Logs to organize notes. Work Logs are now present in Purchase Requisitions, Purchase Orders, and other record types. However, Work Logs are not present everywhere in Maximo… yet. This article will describe how to configure Work Logs for other record types, so that they too can have the benefit of organized, chronological notes. 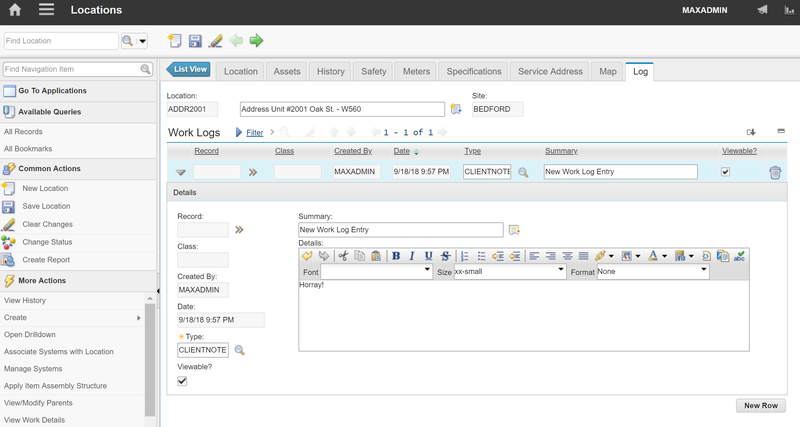 In this example, we will add Work Logs to Location records in Maximo. EDIT: This solution works for site-level parent objects, such as Locations. Organization-level parent objects, such as Companies, will throw an exception as they do not have a SITEID attribute in their table definition. The WORKLOG table has a field called RECORDKEY that is used to store the key attribute information for the related record. In the case of Work Orders, the WONUM field is stored as the RECORDKEY. In the case of Service Requests, the TICKETID is stored as the RECORDKEY. As we are configuring Work Logs for Locations, we need to store the LOCATION field as the RECORDKEY in the WORKLOG table. Before doing so, let’s make sure that the field length of the WORKLOG.RECORDKEY is at least as long as the LOCATIONS.LOCATION field, to prevent character length issues down the line. We will need to relate the LOCATIONS table to the WORKLOG table via a relationship in Maximo. This relationship will be used as part of the subsequent configuration to display Work Log entries that are related to a given Location. Remarks: Relationship to the WORKLOG table, used to find all work log records for a given Location record. The resulting set will contain zero or more records. This is where the fun begins! We need to add the Work Log screen details to our Locations application in Application Designer. The steps below can be simplified by copying and pasting the XML for the new Work Log screen details into the exported Location XML file, and importing the resulting file back. If you run into trouble, watch our YouTube video on how to perform these steps. If you are linking to an object other than Locations, be sure to change the header <section> control to reference the primary key of the object you are linking to. If you don’t want to allow for deletion of a row, or want to control deletion through a Signature Option, you can remove or modify the <tablecol> control with the toggledeleterow event. 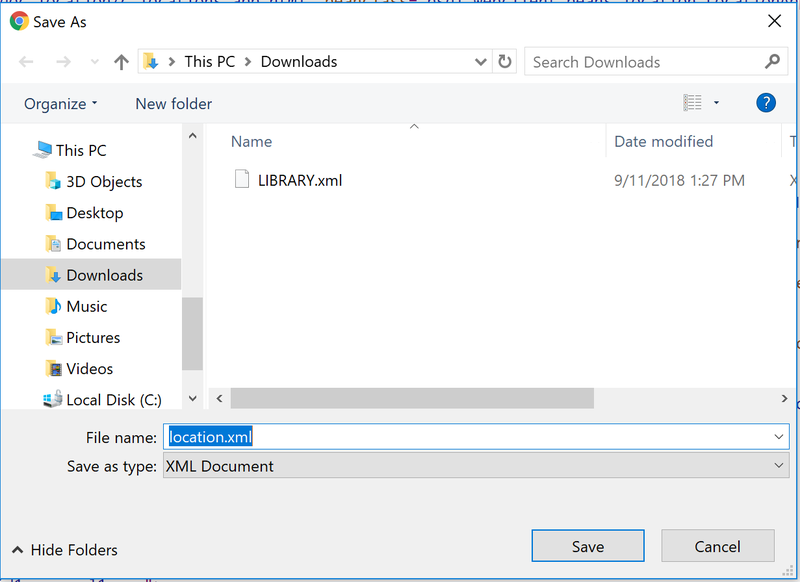 Import the LOCATION.XML file back into Application Designer by using the Import Application Definition button on the toolbar. In order for this to work, we’ll need to create a simple Automation Script to link the Work Log entry with its parent Location. This script will fire upon add of a new WORKLOG entry, and will populate the Record Class and Record Key fields on the WORKLOG table from the parent Location record. This ensures that the current Work Log entry is linked to the proper Location. Now that it’s configured, it is time to try out our solution. Find a Location that you would like to add a new Work Log entry against. In this case, we are looking at the ADDR201 Location from the Maximo Demo database. Congratulations! We have Work Logs on Locations. For a visual instruction of the previous steps, check out our video tutorial. We love hearing from our readers! Feel free to leave comments or feedback below. When I added worklog to Companies object I got an error because the Company object is an ORG level object not a site level one. As such there is no SITEID attribute and the worklog threw an error when trying to add a new one. The only work around I could find was to add a new siteid attribute. Do you know a better work around? Thanks for trying out our solution! While the WORKLOG object is a system-level object, you are correct in that this solution only works with site-level parent objects. Unfortunately there is code in the add() method of the Work Log MBO that attempts to set the Site ID of the Work Log to the SITEID attribute of the parent object. In the case of org-level objects, such as Companies, this will throw an exception. could anybody get that type of info in such an ideal manner of writing? To provide auth to Worklog seems to require also granting the higher level “Save” authorization, which makes many fields editable. 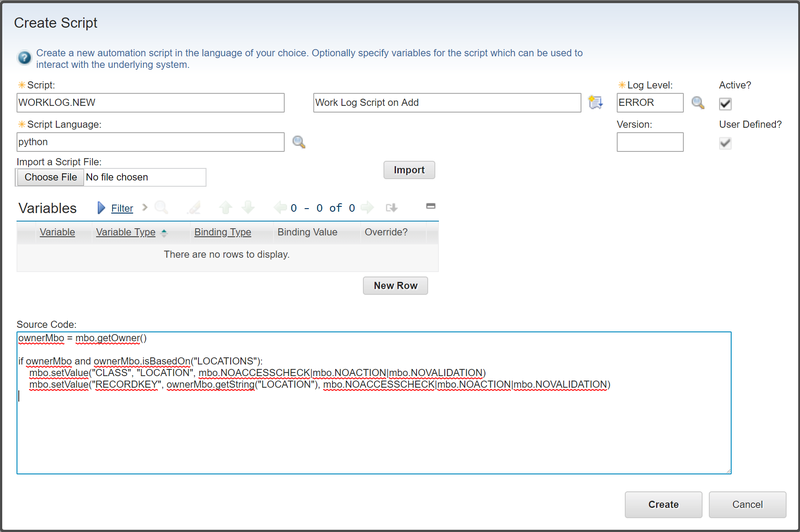 Have you run across a related requirement to provide a “view only” user only access to create worklog entries? Any ideas on how you might provide that kind of access?